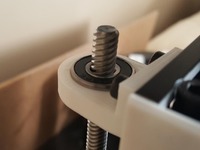 This is a X-Axis upgrade to the Folgertech Prusa i3 2020 Variant, however it should work with any 2020 rail printer, and could be adapted to an all-thread framed printer with a few additional brackets. 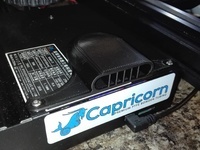 It replaces the cheap linear bearings and 8mm rods with an Openbuilds V-Slot Gantry and rail system. Noise reduction is huge with this upgrade, accuracy is increased and overall stiffness of the X-Axis is also increased. This system is up and running on my printer along with a few others (although there are a few variation in the assembly). This version of the upgrade can utilize various length of rail. The belt tensioner can be integrated (as pictured) in the left side carriage mount or add the end of the rail (V-2). At this point I am not writing assembly instructions as it is pretty straight forward, I have provided a link to a Imgur Album showing detailed photos of the build. This is a work in progress so there are variations of the build (with-in the album) so please keep this in mind when looking through the photos. The endstop mount comes in two version, one has a 2.3mm hole that needs to be tapped, the other has a 3mm thru and will require a 3mm nut. Before: https://www.youtube.com/watch?v=t4HJPyrFLzk In this video the Y-Axis upgrade was installed, the grinding noise you hear is the X-Carraige. Edit: Added a Lead Screw Mount for a M5 Nut, this will allow the stock M5 nut and All Thread to be used in-lieu-of the M8 Lead Screws. Just insert the M5 nut into the bottom of the adapter and mount like any other Lead Screw Nut (make sure the M5 nut is on the bottom). I haven't printer or tested this adapter so please let me know how it works out. I just added X-Carriage_Rail_Mount_16mm_OD_Bearing.STL for the Igus bearings with a 16mm OD. Alos edited the BOM to show the Igus bearings i used, although they are not mandatory, the original linear bearings cans be reused. 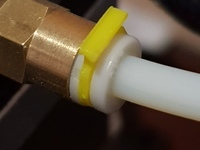 Added another lead screw nut adapters to use in-lieu-of the 8mm brass lead screw nut. 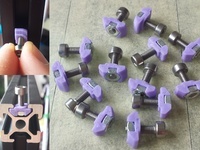 1 x Mini V Gantry Set (Found in the Bundle Section) Note: the Gantry from the MakerStore does not have all the tapped holes, and will not properly work (thanks to 45COLT for the heads up...see comments for details).